How: The campaign offered anyone, anywhere the chance to apply for “The Best Job in the World” – that is, to be ‘Island Caretaker’ at Hamilton Island. It was no campaign hoax or gimmick, rather a genuine job opportunity. 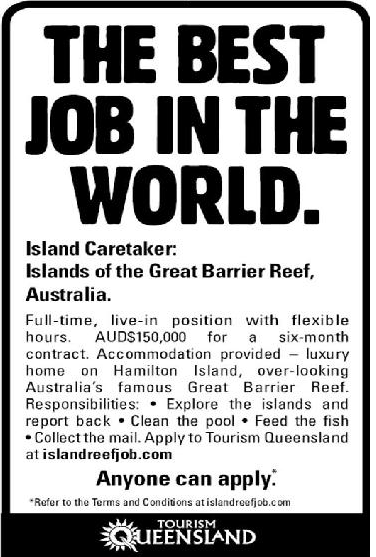 The successful applicant would legitimately be employed by Tourism Australia as Island Caretaker for a 6-month term on a salary of $AUD150, 000 for that period. The caretaker would be responsible for tasks such as feeding the fish, cleaning the pool, collecting the mail and, perhaps most importantly, reporting about their tropical north Queensland experience via social media. The success of Queensland Tourism’s “The Best Job in the World” campaign came from the way it used social media to create an international network of people in a digital space that encouraged Consumer Generated Content (CGC). The public interest in this campaign spurred a ‘social networking frenzy’ (Quinn&Co) that essentially allowed the campaign to run itself, so to speak. The intelligence of this campaign can be seen in the way users and consumers responded to what was on offer. To apply for the “Best Job in the World” applicants were to make a one-minute video detailing why they should be hired. The opportunity received such a response that the public effectively became the driving force of the campaign, in a powerful way that was unforeseen to the campaign managers themselves (considering the site crashed within a few days of launching). This type of campaign was appropriately aimed at a target audience who were ‘familiar with social media and eager to share’ (2011, Ryan, Jones). It was this eagerness to share that really identifies one of the major success points of the campaign. The consumer unofficially became the brand ambassador, thus reaching farther and wider than any traditional campaign ever could. A campaign of this nature and magnitude takes the notion of word-of-mouth to a whole new realm. The marketing team behind the campaign were clever in the way that they developed a concept that would appeal to many whilst sparking the interest of a worldwide media audience. They understood the needs of their audience and offered them a unique opportunity. The “Best Job in the World” campaign exemplifies the creativity that is needed to seamlessly intertwine traditional mainstream media with digital platforms to create a successful marketing campaign. From this example, it is evident that social media is not simply another communication tool, but a powerful medium that can be used to create campaigns that incorporate both the physical and digital space.